I received an incredible amount of great feedback on my Big Ten Expansion Index with comments on the post itself and circulation on various message boards. This Texas alum perspective was particularly illuminating and indicative that my recommendation for the Longhorns isn’t nearly as far-fetched as a lot of people believe (albeit there are some hurdles). I’d also like to point to this comment from a Missouri fan that runs his own blog in support of Mizzou’s inclusion in the Big Ten. It’s a fairly thorough look at Missouri’s qualifications and how they would provide an advantage over the other “usual suspects” such as Pitt – I don’t necessarily agree with all of it but it’s well thought-out. I’ll take a look at some additional schools that I didn’t initially consider in my original post (i.e. Kansas, Maryland, Miami) in the very near future. In the meantime, there are a few issues that have been brought up in the expansion discussions that I’d like to address. 1. Superconferences with 14 schools just aren’t in the cards – I’ve seen a whole lot of suggestions that the Big Ten would look to expand to 14 or even 16 teams in order to turn itself into a superconference. Supposedly, sources within conference itself even suggested that it might be open to the prospect. On paper, this sounds like a decent idea – if the goal is to get into as many new TV markets as possible, then having more schools would serve that purpose (particularly when considering the premium that the Big Ten Network places on adding more cable households). A practical issue, though, is that it’s hard enough to get the current Big Ten presidents to achieve a consensus on one additional school. So, the thought of them trying to add three more schools at the same time is simply extremely unlikely. Even more importantly, there are diminishing financial returns for each school that is added after number 12. The magic of school #12 is that the Big Ten is able to stage a conference championship game at that point, where if it’s worth something close to the SEC version, such game would bring in about $15 million per year. That’s an instant $15 million pop from that 12th school without even taking into account new regular season TV revenue. The conference won’t see that type of pop from any additional schools and, in fact, it’s likely that the value of that championship game won’t change with additional members – it’s going to be worth $15 million whether the Big Ten has 12 teams or 14 teams, so each school is obviously going to take in less from that game if the conference goes up to 14 teams. At the same time, part of the goal for every conference under the current BCS system is to get the maximum allowed 2 BCS bowl bids per season. The 1st BCS bowl bid is worth $17.5 million to a conference and a 2nd BCS bowl bid kicks in an extra $4.5 million, which is all distributed equally among members in the Big Ten. The thing is that the Big Ten is already virtually guaranteed to receive 2 BCS bowl bids every year because of the combination of the conference’s large TV markets and top-to-bottom great traveling fan bases in its current 11-team form – no conference has received more multiple bids in the BCS era than the Big Ten (yes, even more than the SEC). So, every additional school simply dilutes those per school BCS payouts since that revenue is completely fixed. (Note that this is why any knowledgeable Big Ten fan ALWAYS wants multiple schools from the conference to get into BCS bowls. Even if your hated rival is the one going to the game, your own school still gets a big-time revenue boost from that extra bowl bid.) Unless the BCS system (or whatever postseason structure that will govern college football in the future) changes to allow 3 or more schools from a conference to participate, there’s little incentive both financially off-the-field and competitively on-the-field to have a conference that’s larger than 12 schools. Taking all of that into account and using a historical NBA superstar comparison, if the 12th Big Ten member has to be at least at the level of Kobe Bryant, then the 13th and 14th Big Ten members have to be both Michael Jordan and Wilt Chamberlain. As a result, the Big Ten isn’t going to say, “Well, we can’t decide between Missouri, Syracuse and Rutgers, so let’s add all of them!” There’s really only one combination that I could think of where the Big Ten could meet that standard with 14 schools: it adds Texas, Notre Dame AND Miami all at the same time. Even then, there’s the basketball-esque concern that there are too many superstars involved for everything to work together – a team with 5 Michael Jordans sounds great in theory yet just wouldn’t work practically because a team would implode with that many hyper-competitive egos, while a conference with 6 legitimately elite power schools (Ohio State, Michigan, Penn State, Texas, Notre Dame and Miami) would turn the Big Ten from one of the most brotherly and cooperative leagues into probably the most contentious. This is a long-winded way of saying that I’m 99.999999% sure that the Big Ten is simply looking for the perfect 12th school and won’t be going beyond that to 14 or more teams. Take a look at those figures for a moment – every single Big Ten school makes almost twice as much TV revenue every year as the ENTIRE Big East football conference and even makes more than the entire Big East basketball contract (which that conference’s greatest strength). There is no rational president of a Big East university that is fulfilling his or her fiduciary responsibility to such university that would turn down an invitation from the Big Ten for any reason whatsoever (whether it’s what the basketball coach says or anything else). That’s not a personal knock on the Big East (as I’m also a law school alum of Big East member DePaul) but just a simple and glaring reality when you take two seconds to look at the numbers. At the same time, Texas, which had a best case scenario of having the most nationally televised games and a BCS bowl appearance last year under the Big 12’s unequal revenue distribution formula, still made only $12 million in TV revenue compared to the $22 million that schools like Indiana and (gulp) Illinois received just for showing up. Every reasonable person knows that even the best programs go through hard times, so it’s not as if though you can count on the best case scenario every single year. Case in point is the Longhorns’ own rival of Oklahoma, who will receive significantly less money this year for a middling football season after being in the national championship game last year. Michigan was playing Ohio State for a national championship game berth in 2006, yet look at where the Wolverines are now. The recent competitive issues at Notre Dame are well-documented. That means that even a powerhouse school like Texas has to examine where it will be in the event of the worst case scenario when it’s in a conference with unequal revenue distribution, which is something that gives university presidents and athletic directors that have to worry about budgets and state legislatures cutting funding a whole lot of heartburn. This significant worry would immediately go away in the Big Ten – every school gets that $22 million per season whether they win multiple national championships or lose every single game. A “winner” under an almost exact replica of the current Big 12 unequal revenue distribution model recently switched conferences for that very reason. Miami was the single greatest beneficiary under the Big East’s old unequal revenue distribution model, where the Hurricanes received outsized payments from the conference during their national championship runs in the early 2000s. In fact, the Big East said that it would guarantee Miami more money than the school would’ve received from the ACC for 5 years in an attempt to keep the Canes. However, Miami’s president and athletic director pointed to the equal revenue sharing in the ACC as the largest financial reason why Miami switched conferences, even if it meant less money in the good times. What this shows is that university presidents are actually much more concerned about maintaining financial stability during poor seasons than shooting the moon in championship seasons. What’s more interesting in the Texas situation is that even when it shoots the moon in the Big 12, it still only makes about half as much as the very worst school in the Big Ten. In that sense, Texas has even more to gain than Miami since the Canes actually knew they were going to give up short-term dollars in exchange for long-term stability, whereas Texas doesn’t have to make that choice – they’re getting more short-term dollars AND long-term financial stability. At the same time, Texas really doesn’t “control” the Big 12, which is another argument that I continuously see on message boards and blogs. While it receives the most TV appearances out of everyone because it’s the conference’s top team, remember that the original Big 8 schools have been together for over 100 years and they form a supermajority voting bloc in the Big 12. Certainly, Texas has clout in the Big 12 due to its national brand name in the same way that Penn State has clout in the Big Ten, but Texas is still the newcomer to the old Big 8 schools and a lot of them (if not everyone except for Oklahoma) are extremely resentful of the Longhorns. So, the thought that Texas has some type of outsized control in the Big 12 is at the very least overstated. Remember that Miami had very similar control in the Big East, yet they jumped at the chance to be governed by a bunch of crazy basketball schools based in North Carolina. “Control” is such an intangible and fleeting notion that it’s unlikely to trump a massive amount of guaranteed revenue whether a school wins or loses. 3. Traveling fans to road games don’t matter – In terms of sports road trips, nothing tops going to other college campuses. While pretty much all NFL stadiums are bland outside of Lambeau Field, each college has its own unique feel and traditions. However, it amuses me when I see comments on various blogs and message boards that say, “Team A won’t leave Conference X because Team A’s fans can’t take road trips anymore.” Even the best traveling fan bases might send only a few thousand people to road games every week and that school doesn’t see a dime of extra money – under conference revenue sharing arrangements, the visiting school gets the same amount of money whether it sends 1 fan on the road or 20,000 fans. Therefore, if we think about this for a few seconds, why would any university president prioritize the interests of a few thousand people that like to take road trips yet don’t provide a single extra cent of revenue through such road trips over the school making many more millions of dollars of television revenue while also providing exposure to millions of more people? Worrying about traveling fans is a classic “penny wise and pound foolish” argument. 4. Sports team travel costs probably don’t matter – The thought that a school like Texas would worry about the increase in team travel costs in the Big Ten is probably another “penny wise and pound foolish” argument, although I’d love to see if anyone on the interweb has some concrete information about how much these expenses would be. At a high level, my understanding is that Boston College, whose presence in the ACC would probably be the closest example of being a geographic outlier along the lines of Texas in the Big Ten, is still reaping significantly higher revenue in the ACC that more than compensates for its increased travel costs compared to when it was in the Big East. Also, distance between schools isn’t necessarily the best indicator of travel costs. If it’s far enough where you have to get onto a plane (and in the case of Texas, that would be the case for every school that it visits in the Big 12 except for maybe Texas A&M and Baylor), then how far you go on that plane isn’t going to change the costs that significantly (unless it’s a really long-haul trip to a place like Hawaii). For commercial flights, distance is actually irrelevant – a plane flight from Austin to Chicago could easily be less money than a plane flight from Austin to Oklahoma City despite the much shorter distance since plane fares are more based on the frequency of routes and customer demand. If an airplane needs to be chartered, the initial cost of procuring that plane is usually fixed where the cost is the same whether you go 50 miles or 1500 miles. There may be some variance in the cost for fuel and airtime, but it’s still only a marginal increase over the initial cost of chartering that plane in the first place. Considering that the jump in revenue for Texas going from the Big 12 to the Big Ten would be much larger than BC’s increase in revenue was from the Big East to the ACC, I believe that the increased travel costs (even for all of those non-revenue sports) would not be much of a factor. If anyone out there has more specific details on this issue, though, please feel free to post it. As you’ll see in that article, Texas first really wanted to be in the Pac-10, which meant that the school made the decision that it wasn’t going to be in a conference with Texas A&M. However, the Pac-10 requires unanimous approval for any new member and Stanford rejected the Texas bid. 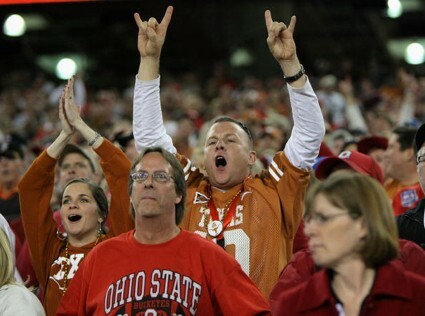 After that, Texas approached… wait for it… the Big Ten. Once again, Texas made the decision to unhitch itself from Texas A&M in that scenario. While the Big Ten showed interest, the conference had a moratorium on expansion at that time since it had just added Penn State, so Texas was rebuffed there. It was only AFTER Texas was rejected by the Pac-10 and Big Ten, where in both instances Texas had confirmed that it was more than willing to separate itself from Texas A&M, that Texas coupled itself back with Texas A&M and approached the Big 8 schools. At that point, the Texas state politicians, who consider football to be of the highest legislative priority, got wind of the plan and forced Texas Tech and Baylor (who neither Texas nor Texas A&M wanted anything to do with) into the new Big 12. So, let me summarize this for everyone: (1) the current Big 12 was the THIRD choice for Texas after the Pac-10 and Big Ten, (2) Texas would’ve broken away from Texas A&M if either of its first two choices had come to fruition and (3) Texas definitely wanted nothing to do with Texas Tech and Baylor. Anyone that thinks that Texas is going to make decisions based on whether it can take Texas A&M along with it isn’t looking at how Texas acted during the 1990s conference realignment. While Texas may care about whether A&M ends up in the SEC, as LonghornLawyer pointed out in his illuminating comment on my previous post, that doesn’t mean the Aggies are anything close to being brothers-in-arms with the Longhorns. 6. The revenue gap means that the Big Ten now trumps the Pac-10 for Texas – That historical article brings up another common argument that Texas might look to the Pac-10 instead, especially since it was the school’s first choice back in the 1990s. This is certainly a fair point, although the revenue situation has changed so drastically in the Big Ten’s favor that a reasonable person is going to weigh things a lot differently today. Take a quick look back at the conference revenue figures back in point #2 and you’ll see why Texas isn’t going to value the Pac-10 over the Big Ten as of today: the Pac-10 has even worse TV revenue than the Big 12. Even if we acknowledge that the addition of Texas were to give a boost to Pac-10 TV revenue, it still wouldn’t come close to more than quadrupling that number which would be required to merely match what the Big Ten makes today (and note that the Big Ten figure would directly increase by a significant margin just from the addition of Texas state basic cable households for the Big Ten Network). Also, putting money matters aside for a moment, there’s a pretty practical issue with respect to Texas being in the Pac-10: the time zone. Most people east of the Mississippi River probably think of Texas as a “western” state. However, it’s in the Central Time Zone (just like 5 of the 11 Big Ten schools). This matters because prime time starts at 8 pm in the Pacific Time Zone (just like the Eastern Time Zone), which means that prime time games in the Pac-10 wouldn’t start until 10 pm Texas time and that’s simply a killer for TV purposes. There are no such time zone issues with the Big Ten because all of the schools are either in the Central or Eastern Time Zones. I know that I’ve put together some incredibly long blog posts, but just remember my two overarching rules of thinking like a university president as opposed to a sports fan and that 11 + 1 = 13. The Big Ten didn’t come out and talk about expansion to do anything other than a blockbuster move. If that blockbuster move isn’t available, then the Big Ten will stay at 11 schools. I’ll be back soon with another post on additional expansion candidates. The Big 10 would mention Texas to try to get ND to pull the trigger. If it was just a FB/Academic Conference yes. Traveling for other sports would not only be more expensive but take more time away from class. The farthest school for Texas in the BIG XII is Iowa State. Iowa would be the closest school to Texas. Texas likes the Big XII because it is easier to win a National Championship. Beat OU and you have a shot. If Texas was in the Big 10 and still scheduled A&M and OU (Instead of the current cupcakes) They would have a very tough schedule which they would be against. Also, Miami as the third school ? Thug University in the Big 10 ? I think if they would go to 14 schools then A&M with the academics and Texas and ND. 14 team conferences cause scheduling problems. If Texas goes BIG 10 OU and A&M go SEC. NU and Missouri would then be knocking on Big 10 door. You are leaving out a few consideration. 1st, If the Big Ten were to raid the Big East and the Big 12 for 3 teams, the Big East would be destroyed (going down to 7 at the most teams) and the Big 12 would need to expand again. It could very well cause a snow ball effect where the SEC could want 14 teams to keep up and grab WVU and Louisville. The ACC could follow suite and grab UCONN and Rutgers….The Big 12 loses their strongest member and could split…or they could add 3 teams to again keep up. The PX, who is also talking expansion might as well go all in and add 4 teams as well If a snow ball effect happens, you probably end up with 98/120 FBS schools in 5 power BCS conferences. This could force the BCS to switch it’s focus to conference champions rather than the polls. If that happens, I can assure you that the value and revenues of conference championship games go up as they now become the defacto football playoffs (Especially if the plus one model is adapted). Additionally, you go against your academic resource sharing rules of the original post with this post. It’s not the athletic monies that are at stake here. Expanding the TV foot print for football is well below diversifying the sources of research resources to the 12 CIC members. TV is just the icing on the cake Adding 3 AAU schools to the CIC would bring in billions to the CIC and protect them against a regional depression we are now seeing in the midwest. That’s the real goal of expansion. Also The TV revenues of the big east/big 12 don’t speak to the popularity of the conferences, they speak to the deals and media resource sharing models of the conferences. The Big Ten has to the BTN which has been a money making success that you won’t hear about in areas outside the BTN footprints. The YES Network proved years ago that controlling the production and distribution of your media product is much more efficient and thus profitable then the old model that the BE/B12/PX and some extent the SEC is working under. That’s the reason for the discrepancy, popular schools outside the B10 with large built in alumni/fan bases probably thrive, media profit wise, under the current B10 model. I’ve enjoyed the “expansion” posts a great deal. I must say though that I think you are off base on the expansion being limited to 12 teams. The BigTen championship game revenue is a moot point, it really is. The financial consideration is all about cable. Every million tv households that go from out of market to in-market is worth about $4MM annually to the BTN. It doesn’t take too many incremental households then to justify a split of 14 or 16, rather than 10. That means a school would only have to add an addition 4-5 million households for the economics to work. Lots of schools meet that requirement. If and when the BT becomes a Superconference the BCS will change…practically to whatever the BigTen wants it to become. This isn’t a basketball team and additional star power is only going to help the conference as a whole. The objective will be to add enough star power that the Conference Championship game is essentially a play-in game for the National Championship. That means every conference game becomes critical. You do that by adding college football superpowers to the mix. Here’s the quick wrap-up. TV money gives the BT the capability to do something outrageous…like adding UT, Miami (or Florida), ND, Nebraska and Syracuse. You could literally double the size of the TV footprint and probably position the BigTen conference as one of the most powerful sports entities in the US, competing with NFL, MLB, NBA, etc in terms of its TV potential. I think the academics will get on board with aggressive expansion as well. Everyone knows about the coming correction in Higher Education and if you are a University President one way to insulate your school from the coming fallout is to take steps to make sure your brand is elite. This will benefit the new schools and it will benefit the existing schools. The Big Ten expanding to 16 teams would revolutionize college football and as you alluded to – create a defacto playoff system (conf championship games would become 1st round regional playoff game). Imagine the Big 10 poaching UT, A&M, Nebraska, Mizzou, OU. Expanding the conference footprint drastically. This would force the SEC to expand with 4 more teams (poaching Miami, FSU, Virginia, VTech) The 8 remaining ACC teams could join the 8 football teams of the Big East to create their 16 team conference. Which would become a basketball powerhouse x10 (24 basketball schools could be split into two 12 team conferences). The Pac10 could expand by poaching 6 teams from the MWC & former Big 12 (Utah, Colorado, CSU, BYU, Baylor, Kansas). This one is a little trickier. In essence there would be 4 super conferences now with massive reach. West Coast (Pac10), Midwest (Big 10), South (SEC), Northeast (Big East/ACC). Now you could have the 4 conferences champions still square off in the BCS games and enact a plus 1 system. You have now preserved the bowl games and created a defacto 8 team playoff (each division champs of conferences would be have a shot). This would leave the remaining teams to form another 16 team conference (former Big 12/former MWC/WAC). Or have a sleuth of “independent teams” like Notre Dame. Notre Dame would still have the same tie-ins to the BCS so they would not be left out altogether, but would have a very difficult time breaking into a “playoff” spot. Wishful thinking maybe, but not out of the realm of possibility. Frank, interesting information that you have provided. As a Michigan guy, I would certainly love to see a program of Texas’ stature added to the Big Ten. However, I still find it hard to believe that the Longhorns would jump even if the numbers indicate otherwise based solely on the fact that they would be completely isolated from the rest of the league. Travel costs and distances would not be an issue, like you pointed out, and traveling from Minneapolis to State College is likely just as expensive or even more expensive than traveling to and from Austin. But unlike PSU and Minnesota, the outliers of the Big Ten, Texas would not have a border school like Ohio State or Wisconsin to really “feel” like they are part of the league. Therefore, I think the only way it could happen would be for Texas to come along with A&M. This way they are not totally removed from the rest of the league. Basically, my point is that to get Texas, I think you would have to go to 14 teams. Again, another reason why I think to get Texas, you need to go to 14 and make sure you put some strength (or at least perceived strength) in that West division. This would preserve virtually all of the traditional rivalries (note that I don’t think that the Land Grant Trophy game between Penn State and Michigan State is really worth saving annually), gives each of the 4 power schools (Michigan, OSU, PSU and Texas) at least 2 games per year against other power schools (giving maximum TV exposure nationally) and all of the other non-power schools at least 2 games per year against power schools (which is important for TV marketability and ticket sales). I know it’s absolutely crazy and would never happen, but as a thought experiment – in this case, thinking (way) outside the box – a definite 11+1 = 13 program is USC. Think about it: Southern California has 24 million people, which makes it *twice* as large as the population of any state represented in the Big 10. Plus, unlike any of the Big 10 states, demographics is on its side as the SoCal region is growing fast. In terms of transportation for those non-revenue sport teams traveling commercial, it’s probably easier and less costly to get from Los Angeles to any Big 10 destination (fly to Chicago or Cincinnati and then transfer) than it is to go from say, Madison Wisconsin to State College PA (where you’re likely transferring twice). USC has a huge media following (since they play in the second largest media market, and are the de-facto pro team of Los Angeles), and we’ve already seen that their games v. OSU draw mega ratings. Finally, USC is a top 50 school in terms of academics and would nicely with all the Big 10 schools in that regards. Would it ever happen? Absolutely not. But if you’re going to mull over unlikely candidates like Miami (which has no traditional rivalries with any Big 10 school), you could do a lot worse than USC. USC would be fascinating, but I would say in terms of stability, the Big Ten, SEC and Pac-10 are at one level – all of those schools are pretty much locked into place and they are very tight conferences. So, that’s why I’m not looking at SEC and Pac-10 schools (as I’ve also seen suggestions of Vanderbilt, Kentucky and Tennessee). I originally stated that I wasn’t going to look at ACC schools and still personally think that the conference is much closer to the “very stable” end as opposed to the “unstable” end, but the Miami scenario is specifically intriguing to me for a number of reasons – short history in its current conference, the school is much more dependent on TV money than gate receipts, Florida (and South Florida in particular) has the greatest concentration of Big Ten alums outside of the Big Ten footprint itself, travel issues don’t matter since they have to get on a plane to visit opponents no matter what conference they’re in, and they actually do have a dormant rivalry with Penn State. I’ll expand upon this in a later post. The problem with USC is that they’re on pacific time. They would never get a primetime matchup out there with so many teams on central and eastern time. It’s tough to imagine Michigan at USC at 11pm eastern. So USC would only be able to play a night game with an OOC matchup. Very well written. I am sitting here in Texas and though I see UT’s move to the BT as unlikely, your points are salient. I agree with the other Tom that UT would need a partner-in-crime to go to the BT, whether it is A&M or OU, I am not sure (both rivals are big down here even the UT-OU gets more national play). Now if you want to go to 14, how about UT, OU and Nebraska? Don’t want Miami and assume ND still isn’t interested. A big consideration though, UT and A&M are somewhat tied at the hip. Very bizarre explanation and here is the short of it. Texas is the only state that has “Spanish Law” instead of English Law (Lousy-ana does still have Napoleonic French Law as well). What that means is that along the way the Boards of Regents for UT and A&M are cut from the same cloth and are in essence one school, UT at Austin and UT at College Station if you would. Even though each have their own branches – the UT system and the A&M system, they are still linked (Texas Tech is not part of that system). Both are somewhat controlled by the State Legislature (also unique to Texas) instead of being independent entities. Therefore, it would be unlikely for the same owner (state leg., albeit a part owner) to let one go and not the other. That was a reason (along with the ones mentioned about) that Texas couldn’t go to PAC-10 and Big Ten earlier. Just because they made overture by themselves doesn’t mean that they would have been allowed to go by themselves. Illustraion: Big sister wants to go the movies with a big beau, but Daddy and Mama makes her take along lil sis on a double date (for many reasons). Big sis acted alone to get the invite but had to take the squirt with her. UM and Ohio State have to be in the same division to ensure they play the last regular season game of the year every season and so that they couldn’t meet again in the Conference Championship game a week later. Which means Penn State and the 12th team will be in the other, assuming the 12th team is a powerhouse. Then again, even if they’re not a powerhouse, I don’t think they’ll go to the Big Ten if they have to deal with both UM and tOSU every year in their division. If you put UM, PSU and tOSU in the same division, you run into the same problem the Big 12 has now, whoever comes out of that division gets the BCS bid 9 times out of 10. In other words, you don’t want 3 of the best 4 teams in the conference in the same division. Don’t be so hung up on geography when determining the division names and allignments. I completely agree. It needs to be Michigan and Ohio State in one division and then Penn State and (hopefully) Texas in the other. If it’s a school like Nebraska or (gasp) Notre Dame, they would fit well paired up with Penn State, too. The Big Ten will NEVER kick anyone out. Northwestern is a charter member and the most academically prestigious school in the conference (well, if you don’t count the University of Chicago in the CIC), while Indiana came into the conference only 3 after its formation. These schools have been together for a LOOOONG time – well over 100 years – so no one is moving. Since Indiana is in the Top 5 most valuable basketball programs (see Forbes) I’d have to say your suggestion is misinformed, at best. IMO, there are a few major hurdles for Texas to overcome before they’d make the move: Overall schedule difficulty, recruiting, and long-term regional viability. As someone else mentioned, the fanbase’s desire to keep games against Texas A&M and OU (presumably out of conference) would raise the strength of schedule to a nearly ridiculous level. As it is now, Texas has between 2-4 tough games every year for a shot at the conference crown. That goes up to maybe 4-6 in the Big Ten. Perhaps the “new Big Ten” will have the same caché as the SEC, and winning the conference with a loss will still put you in position to possibly play for a MNC. But it’s an unknown. Regional recruiting is the biggest reason why teams in or near California, Texas, Florida, and Ohio have had so much national success. Arkansas was a tremendous football team for years while they were in the Southwest Conference. Once they moved to the SEC, their pipeline to Texas talent all but dried up. Would a Texas move to the Big Ten open up the floodgates for Ohio State and Michigan to begin taking the guys that normally Texas gets? Or would the distance be too much of a factor and Texas cements its stranglehold on the state’s best players? Hard to say. Arkansas is no Ohio State or Michigan. Lastly, will the Big Ten’s population base erode away in the coming decades? Most trends show people moving to the warmer states, especially as manufacturing jobs in the Midwest dry up. Perhaps those cities revitalize themselves (let’s hope, for the sake of the country), but if not, then a huge demographic shift will only worsen the Big Ten’s long-term prospects. There are so many moving pieces that it’s really an interesting discussion. Great job breaking it down. I definitely think this discussion is one of the best I’ve seen on the subject. Not accepting that the Big Ten is the wealthiest conference in the country and that the most important factor by far is opening up new cable households (forget irrelevant tv ratings) are the biggest failures of most talking heads on the matter. However, Charles, I don’t think anyone needs to worry about the Big Ten’s long term prospects as long as the league is going 4-0 while dominating top 15 competition in bowl games, and the BTN is raking in cash for the league. It’s good that you found the SAEN article on the break up of the SWC, but your reading of that article as showing that A&M and UT would act independent of the others interest is materially flawed. As the article points out at the very beginning, both schools wanted to leave the SWC. Initially, both hoped to land in separate conferences and to maintain the rivalry as a non-conference affair, but once the politicians got involved and forced UT to find a home for Baylor and Tech, A&M was required to come along for the ride, despite it’s preference for the SEC. The key difference between that scenario (where A&M and UT both move to better, albeit different situations) and the one you outlined is that in the current scenario, A&M is not looking to leave, and would probably have nowhere better to go. That is the kind of situation which would make politicians take notice. UT and A&M split (2/3 and 1/3) revenue generated by the Permanent University Fund, a fund initially comprised of oil revenues from state lands, and now consisting of billions of dollars invested by UTIMCO. If UT and A&M were “divorce” athletically, a political and fiscal split (including the unravelling of UTIMCO) would be messy beyond belief. Further, it would just be totally out of character with the way the schools have operated for the last 30 years, working very closely to promote higher education and protect their funding source in the Legislature. Finally, although this is a minor point, and may sound far fetched for Big 10 fans, I find it hard to believe that Texas baseball fans would allow Texas baseball to be endangered by being forced to play in the worst BCS baseball conference, one that shows no sign of ever being competitive. Longhorn fans treasure those national championships, and its hard to see UT baseball being a juggernaught if it is saddled with playing a Big 10 conference schedule. I actually thought of the baseball angle too. Big Ten peope may not realize how big college baseball is in Big 12 and SEC. I watch as many college baseball games as I do college basketball. If Texas were to go to BT (again unlikely), they would have to get a killer schedule with a lot of home games early (even in conference play). Not interested in playing baseball games in Ann Arbor in February (or even April actually). Big Ten expansion is a great idea and long overdue. Yes, it would be ideal to add UT or ND, but I just don’t see it happening. I’m no gambler but I see either Mizzou or Pitt as the twelve member. First, I have to say that this post and your previous one are absolutely spectacular. You have far and away the best analysis of the Big Ten expansion that I have seen. I had no idea Texas wanted to join the Big Ten in the 1990s; that’s crazy! Although I think there are a ton of benefits for Texas to join the conference, I also wonder if they actually would jump at the opportunity or be able to. The numbers might support it, but do influential alumni really care? Also, I am not sure how conference changes work, but, being a public university, would Texas have to interact with the state government on this one at all? Would the state government get in the way of it? Just some questions that I am genuinely curious about. I wasn’t exactly old enough to be paying attention to the PSU realignment when it happened, and I wasn’t a Michigan fan until I came here in 2007. So, any information on how it works would be illuminating. “Academic reputation” is guilty of the same biases that affect recruiting–take a two-star kid in Massachusetts and put him in a small town in Florida and report interest from Notre Dame and Alabama and he magically becomes a four-star kid. The process of determining reputation is largely done by interviews, surveys, and conjectures by those in the process of ranking schools. Take a Missouri, Nebraska, or a Kentucky and put them in the Big Ten and their academic reputation would skyrocket merely due to their association with the Big Ten. They don’t need to improve their academic reputations as much as they need a smart marketing campaign that will convince US News & World Report and CIC members of their quality education. Also, I’d like to see you use your system to rank every team. Basically, if tomorrow every conference disbanded and the Big Ten could extend invites to any twelve schools in the nation, which twelve teams would they pick on the basis of your system? Otherwise this entire system seems a bit self-fulfilling. It’s not self-fulfilling. Academics isn’t merely about the general quality of the school in question, but about “institutional compatibility.” 10 of the 11 schools in the Big Ten are major state universities that are research giants. The 11th is a charter member of the conference that will never leave. The reason Texas fits in so well with the Big Ten academically is because it is a research giant that would add untold millions of dollars in research, faculty and support to the other Big Ten institutions. Syracuse and the oft-mentioned Boston College are basically incompatible from an academic standpoint. Both are excellent schools, but very different schools than 10 of the 11 conference members. Looking at Eastern schools, there are only two schools that fit the bill – Rutgers and Maryland. Maryland is far more likely for reasons outside of the academic theory alone. 10 of 12 are premier state universities and the other *two* (lets not forget voting and on-‘temporary’-athletic-leave member University of Chicago) are founding members and not going anywhere. As far as the US News rankings go, its actually shortchanges the quality of most of the big 10 (12) by having built in biases toward small private schools with big endowments, like the highly overrated Notre Dame, which would be ranked 3rd after northwestern and chicago in the hypothetical big13 according to the general school rankings, yet every single specific program would be at or near the bottom compared to big ten schools. Compare that to a Michigan or Wisconsin, which are ranked in the 30’s, even though their individual academic programs, graduate or undergraduate, are almost universally in the top 10. Only a handful of other schools really fit the bill, and he only one that really outmatches texas, were it available, would be maryland, which is even better academically, reasonably comparable athletically, better geographically, and not bad from a media market perspective with the large, wealthy, and very influential DC area. The addition of maryland is much more realistic than you would think, and would leave the big 13 rivaled only by the ivy league academically. One flaw with the point of texas considering going to the big 10 for the cash, is that it would severely damage the big 12 cash flow to the other texas public univ. Would the Texas state goverment allow that? Would the gains for Texas outweight the loses for the other texas public univ. One concern people keep mentioning is the need for Texas to maintain its rivalries with A&M/OU, but I’m not sure that’s a significant problem. I’m a student at Penn State and I know we used to have a big rivalry with Pitt that started back in 1893 which has waned since we joined the Big Ten. I bet this rivalry was about as strong as the Texas/OU or Texas/Texas A&M rivalries, but losing the annual Pitt game hasn’t been a big problem. Sure there’s some grumbling, but nothing serious. I don’t think it would be a big long-term problem for Texas if it had to give up one or both of those rivals. I have been saying this for months. Not only is Texas logical, because of the massive change in college football economics over the past 15 years, it is actually a better choice than ND. One thing I disagree with though — do not count out the 14 team super-conference idea. The B10 already has hinted they are looking at it and, if ND and TX don’t play ball, one killer idea would be to add Syracuse, UConn and Boston College (or maybe Rutgers, but BC is way better). Unlike adding just one NE school, adding three premier names would grab enough of the major Northeast media markets (including NY and Boston — and we already have Philly because of PSU) to get the B10 Network onto basic cable in that region. It would also enable the B10 to steal two elite basketball teams from the Big East, putting the B10 in position to challenge the ACC and Big East for top basketball conference. Go run the numbers on my idea. Just make sure you give them full credit for the media impact. No question, the B10 is a very conservative group and would prefer to simply add ND. I am sure they will take a hard run at TX too — they are not stupid people. But if those two give us the cold shoulder, no one else really makes any sense (sorry, not even Syracuse). If ND and TX turn the B10 down, do not be surprised to see my “Northeast Invasion” idea move center stage. Financially, it would be just as good if not better than adding either ND or TX, albeit a lot more complicated and risky. And beyond these three ideas, I think they sit tight and add no one. They will wait until ND or TX cracks (like it or not, the money will win out eventually … it always does). The one major point you forgot to mention is the Big 12 is garbage in football. Who cares if Texas makes more money off of revenue sharing if they have to play Northwestern and Indiana every year. The winner of the Big 12 and SEC is usually placed in the NC. If Texas moves to the Big 10 then they will have to be put in the BCS mix. Ask Cincy how that worked out for them. 1. As the crow flies, BC is almost exactly as far from the average ACC school than it is from the average Big East football school. Big East football is very, very spread out, and BC just isn’t near any similar all-sport universities. You correctly note that it isn’t all that hard to fly somewhere these days, particularly if the schools in question are served by major airports. BC’s travel expenses are up only 25-30% in the ACC, whereas revenue more than doubled. 2. As you have sagely noted throughout your posts, universities care about revenue and academics. These are exactly what drove BC to the ACC. Big East football schools have nearly nothing in common with BC (much like Texas in the Big 12). In contrast, the ACC is one of the top two academic conferences (with the Big Ten) and the ACC has several smaller private schools who fit BC’s profile. Again, your analytical framework for analyzing the Big Ten’s expansion seems consistent with the ACC expansion. 3. Other than football, most sports allow for a number of non-conference games. So you can schedule any historical opponents in hoops, soccer, baseball, etc. to the extent you are no longer in a conference with them. BC has done this with Big East basketball schools. Texas will never happen. Texas has a very different sports culture from Big Ten schools — a heavy emphasis on outdoor sports and Texas has many fewer sports than Ohio State or even Iowa. 1. give Texas $10 more to spend on football and basketball that Ohio State doesn’t have since it already gets BTN money. 2. concede baseball superiority to a school in a warm weather state. Big Ten schools might win one or two games a season against Texas. Ditto outdoor track and field and golf. 3. to illustrate the difference in sports culture, we have gymnastics, wrestling, and hockey, as well as other lesser indoor sports like fencing and pistol. I do have one question about how the CIC would work with Texas–does the entire System benefit, or just the campus with the football team? I think this is pertinent because a large portion of the research funding that The University of Texas pulls in goes into biomedical research, and that research is conduct primarily out of either the UT Medical Branch in Galveston, UT Health Science Center in Houston, or UT Southwestern in Dallas. It would make no sense to exclude these campuses from the CIC. But at the same time, if you include them, do you have to include other campuses in the system that have their own undergraduate programs (e.g., UT El Paso and UT San Antonio)? I’d be curious to know how the CIC currently deals with “satellite” campuses of its current members, such as IUPUI. LonghornLawyer – this is a prescient question because I was just thinking about how the UT system overall would be dealt with in the CIC. I would foresee that it would very similar to how the University of Illinois system is treated in the CIC, where the University of Illinois at Chicago is a “guest member” by virtue of its biomedical research and running the U of I Medical School. As a result, UIC participates in the academic consortium just like the other Big Ten members. However, the University of Illinois at Springfield, which is a smaller undergraduate-focused institution with very little scientific research, doesn’t have access to the CIC. It would make perfect sense that the UT medical branches would be treated in the same way as UIC since they perform an incredible amount of research (I saw on some web pages that the medical branches actually have more research expenditures than UT Austin itself), while UTEP, UTSA and other campuses which don’t have a research focus wouldn’t be part of the CIC. In fact, that really should be the political sell in the state of Texas – a move to the Big Ten isn’t just a matter of football games in Austin, but also opening up access to more research funding for the state’s major medical institutions in Dallas, Houston, San Antonio and Galveston. Not being in the same conference as Texas A&M might be politically unpopular on its face, yet if that’s coupled with the words of “more medical research = more jobs”, then it becomes a bit different for the legislators in the metro areas that have vested interests in those medical branches. I agree with the political calculus on that, especially in the House, where the speaker is from San Antonio. San Antonio has for years been trying to re-brand itself away from its tourist and convention based economy toward a more research based economy. Obviously, UTHSC is a big part of that. The Galveston legislators would also be up for approval if it came with a guarantee that UTMB would remain in Galveston (a very open question after Hurricane Ike) and be enlarged as a result. The Lt. Governor, however, is an Aggie and that is going to make the complete ditching of A&M a very difficult sell in the Senate. It must be remembered that it was Lt. Governor Bob Bullock who was powerful enough to get Baylor and Tech into the Big 12–the governor is of no consequence to these discussions. As pointed out in one of the comments, Texas and A&M are closely linked financially through the Permanent University Fund and through UTIMCO. They’re also closely linked from a constitional and historical standpoint in Texas (A&M was, for a long time, a branch of The University). If A&M were able also to get a “guest membership”–how very country clubbish, by the way–that would increase their research revenues, perhaps that would pave the way to placing them in the Pac 10 or a watered-down Big 12. Between the additional research dollars to Dallas, Houston, San Antonio, and Galveston, and the give-away to A&M, that’s probably something we could get through the Legislature. LL isn’t as up on his A&M / UT relationship as he thinks, A&M was never a part of the UT system and was in fact, established before UT. Given his factual error there, it makes me wonder how much of his viewpoint is accurate, given his UTcentricity. Sorry to bust up the parade, but the Big Ten would never consider Miami. They don’t sell tickets for most of their games and don’t even have their own stadium. They are more similar to a commuter school than a school like Texas or Notre Dame. If the Big Ten were to consider any non-SEC southern school, FSU would make a lot more sense than Miami. They fill their own stadium nearly every game, especially when they are playing at a high level or expected too. Florida would make more sense than FSU, but Miami makes no sense whatsoever. The Miami idea actually makes this article less credible it’s so bad. The real reason that the Big Ten can almost always be assured of two (2) teams making it into the BCS is b/c it lacks a conference championship. I don’t really buy that argument. The real reason why the Big Ten gets multiple teams in the BCS more often than not is that almost all of the schools travel to bowl games extremely well (with large TV markets being a secondary consideration). The SEC certainly hasn’t been hurt by having a conference championship game and they have no problems getting multiple schools into the BCS (and that’s also largely because their fans travel en masse). The ACC’s inability to get multiple schools into the BCS has nothing to do with its conference championship game and everything to do with its smaller fan bases. For the Big XII, if multiple teams out of Texas, Oklahoma and Nebraska are in the BCS top 14, then that conference will get multiple BCS bids. As for the other Big XII schools that might be BCS-eligible, it’s a crapshoot. The traveling ability of the schools involved mean much more than the existence of a conference championship game. duffman – the people that run Texas will never join the SEC because of academic concerns. That’s also a big selling point for Texas to move to the Big Ten and Pac-10. If you look at the San Antonio Express article that I’ve linked to that outlines the history of how the Big XII was formed, you’ll see quotes from the then-UT president about why they talked to the Pac-10 and Big Ten while refusing to even consider the SEC because of academics. Most Texas alums that I’ve come across say the same attitude prevails today. Remember that changing conferences isn’t a football decision made by the school AD. Instead, it’s an overall academic institution decision made by the university president. Very interesting read. Let me point out that it’s a stretch to say that the Big 8 schools have been together for over 100 years. Only 4 of them were around at the start of the Missouri Valley and Oklahoma State didn’t join them for good until the end of the 50s. Not that it takes away from your point. A few things about revenue and adding more than one team. Yes, a conference championship would bring $15 mil a year, however, the Big Ten could bring in a few schools and still bring in a lot more money. Missouri would bring $18 min a year just on cable subscribers, does not include satellite subscribers and advertising. Rutgers would bring $26 mil/year on cable subscribers alone and Maryland would bring $30 mil/year. That would make sure the Big Ten schools didn’t take a pay cut. Hard to figure how much Notre Dame would bring and Texas would bring around $60 mil/year. Yes, Texas would be the homerun they are looking for but there are other options if they do decide to expand and are unable to bring in Notre Dame and Texas. Will be interesting to see what happens, I am hoping the Pac 10 invites scare Notre Dame into joining the Big 10 and they stop at that.